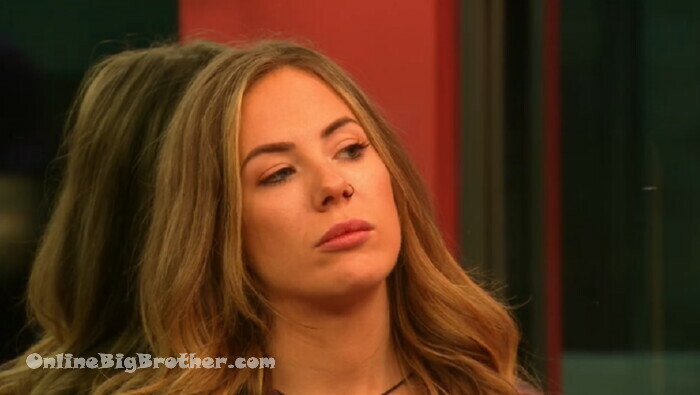 Big Brother Canada Spoilers – Tonight is a double Eviction. WhooWEE! The vote’s are pretty much locked to get Chelsea out. Stef asks if CHelsea has talked to her. KIKI – no not today..
Stef says CHelsea is bringing up the girls alliance again saying they need to get the boys out. Stef – I don’t want to talk about it.. If she brings it up..
Stef – yeah it got a little sad.. They talk about how much Kyra annoys them. 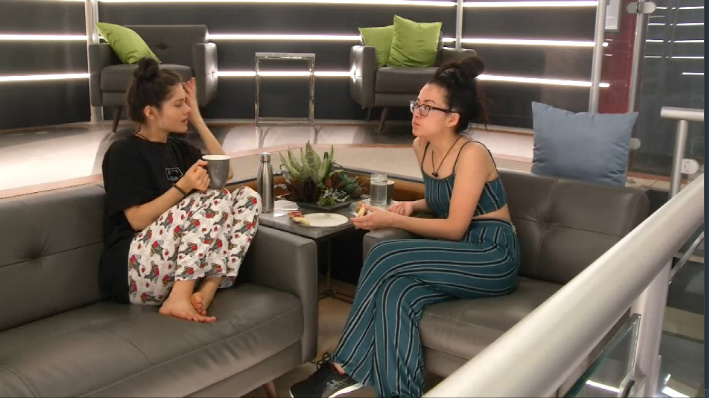 Stef says her and Dane were talking before they went to bed they should aim for final 8 you me, Dane, Damion, Mark, ANthony and then we tell Anthony than Cory is in on that..
Stef – when it comes time for it we will tell him Cory is in on it we’ll vote out Cory and Keep Adam instead. Adam is the next biggest target. Stef – Eventually we’ll need to get rid of Mark, Anthony and Adam but then it’ll be Damien, you me and Dane..
Talking about the guys alliance. Esti says that all the guys alliance talk started with Kyra and she’s not sure how reliable that is. Sam says they should still be looking out for each other. They agree to keep an eye out for the guys alliance. Sam – we’re smart and strong we can use what we’ve used already to keep going. They want to keep things from Kyra. Stef and KII agree they won’t do the same to her. Sam – I don’t care if we don’t take to each other but it can’t happen where we’re picked off.. It can’t happen. Stef says if one of the stronger gus win they have to suggest easy targets until they can pick things up. Stef says she never really noticed how people hang around now she’s seeing the guys all the time. Sam – I love Adam to death but I came here to play Big BRother not get played by a bunch of dudes. Esti – if the dudes are doing something I can see Adam riding with them but..
Sam wins head of household. 9:50pm Feeds come back. Sam wins head of household. So Este ran to Dane straight away about the bro alliance info. What a bad move. She is such a bad player. Even if you are still going to vote out Chelsea you should have sat on the info. I don’t know why she is so liked in the polls. Probably afraid Dane would find out she was told. all we really need to do is start calling este raven. and maybe get cory a scooter. Was thinking precisely the same thing. The fact Este is willing to go with Dane naming off the PB & her without her BFF Kiki even mentioned in the mix is also disconcerting. I was holding out hopes for Sam, Kiki, Este, Corey (and actually Damian) to find a pathway toward each other in order to break up the PB’s. BUT — it looks like Kiki will get the axe first Corey has bought in hook, line & sinker to Anthony/Adam, ditto for Este with Dane & Damian just wants to be “one of the guys”. I wasn’t a fan of Chelsea’s game and got annoyed by her seeming self-perceived value being “above” others BUT if this is how the rest of them are going to play I’m now understanding why she believed it. The only hope we have now is if Eddie wins DE HOH & when the guys threaten him to take out Sam he ignores them – turns the screws on the PB and puts up Adam/Dane (with Anthony) as the replacement. Otherwise, I’m afraid we can fast forward to the triple evict when Mark will try to win & screw over his buddies. P.S. The one thing I am wondering is how Este will react once she learns it’s Sam & then Kiki who they want out in terms of the order. Or is she just self serving to push herself deeper & Kiki is just her female version of the Dane shield? I’m going to the double eviction in a couple of minutes! They load at 2:30. Excited. Not happy about Chelsea leaving though. the hamsters get a clue. Likewise – although these players should be able to use logic apparently they can’t so contrary to my typical leanings I hope an audience member screams when Chelsea opens the door to leave: “ESTE- DANE is a LIAR THERE IS 4 MAN ALLIANCE to the end! These naive players need to grip as to the reality of what’s really going on. You can email them anytime. imagine the lemmings of season 19 vs. foutte. Following up on my comments about Este and the predictability of the season. I wonder if this keeps moving in its current direction if it will result in the end of BB Canada as we know. I mean – they almost cancelled it last season & who wants to watch a season where you know the ending before the fourth person walks out the door or jury has started? Which seems to be where this is headed. Re-upping my wishes for an Eddie DE HOH & an oust of one of Anthony, Adam or Dane to shake up the house and destroy the PB. For the person who stated they’ll be in the audience PLEASE PLEASE PLEASE — when Chelsea calls out the all-male alliance make sure the audience cheers loudly so these gullible, naive players like Este get a grip as to the reality of what’s really going on. Just because you don’t like the way the current game is playing out doesn’t mean it’s an unwatchable season. Seems there is something else going on here as it relates to your comments. Is it along the lines of Eddies rather racist comments about wanting to see 2 minorities in the final two. Does this include women? Imagine for a moment if a “white dude” stated it would be great to see 2 white people in the final two….Yeah, hypocrisy at its finest. WOW – NO —- there is nothing else going on here at all. I come on here to share in my love of Big Brother. 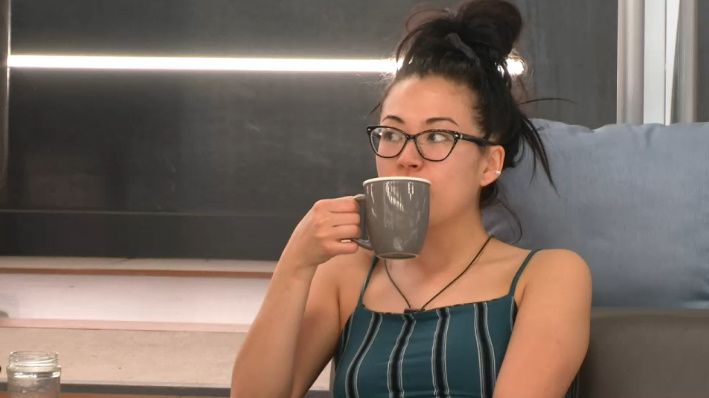 I’m simply making the statement BB Canada almost got canceled last season & I”m worried if there isn’t enough drama this season it could be headed in that direction. From a personal standpoint, I have no vested interest in one culture or gender winning over another. If it had been an all-female alliance I would’ve requested the exact same thing. The fact you somehow compared my hope the season doesn’t get canceled as being racist is extremely upsetting. To ANYONE who felt this was my intention – I apologize — it WAS NOT. once amber… i mean chelsea escapes… what if beastdud cowthey is evicted next… and they have to do exit interviews together? i predicted the wrong lgbt asian….. ouch. guess i should have said i predicted kiki for a week because of current storyline assessment added to the weird statistic of over all percentage of lgbt representation in all seasons together vs. the percentage of lgbt hg’s that have been evicted on twist + instant+double +triple evictions. i concluded kiki and didn’t consider eddie. Sam wins the next HOH..
and will 90% target a woman. Surely the house (READ: Females) has to see now that the PB alliance is a real thing. 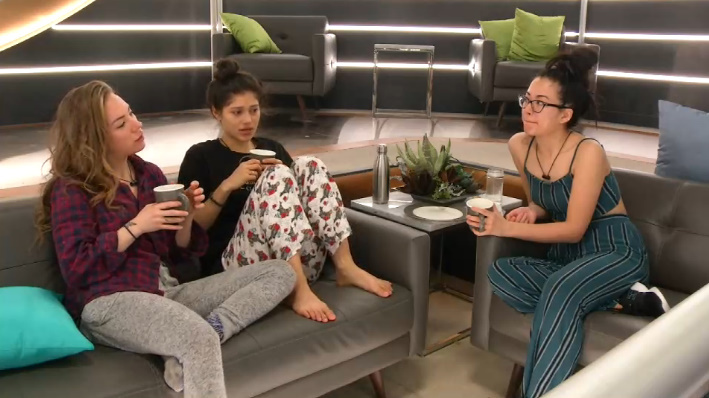 Why else would Adam nominate Kiki & replace with Kyra? That action alone has to make Sam/Kyra be sitting up and taking notice. Perhaps we’ll finally get some action this week coming off that action – or at least one would think so. Moving forward – if Dane or Anthony win HOH they’ll target Sam and keep their PB alliance safe. AND if anyone else wins expect the PB alliance to start forcing their hands to put up who they want (read: females) then hopefully those individuals look in the mirror to remember they aren’t sheep and are actual game players. Why Eddie? What did he do? I’m so confused! yup & the next one will be too. I have no idea why these women even bother talking to each other since all they do is bury each other. Kudos to Anthony who doesn’t even need to win b/c if Sam isn’t nominating him then no one will.